The Ericksens' garden started about 15 years ago when they established three different rose beds with an assortment of hybrid teas, floribundas, and miniatures. Slopes along the street were gradually planted with an assortment of flowering shrubs with annual and perennial plants along the walks and driveway. Recently they replaced the front and back lawns with cactus and succulent gardens along with a small collection of these plants scattered around in pots. 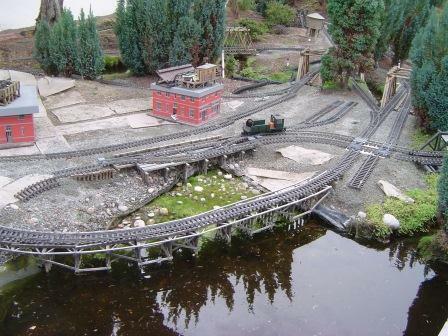 There is a garden railroad with 800 feet of train and trolley lines based on railroads in South Seattle and King County, Washington during the 1890-1920’s. Two ponds (one with a tide to represent the Puget Sound), three streams, five tunnels, numerous bridges, trestles, buildings and plantings provide the landscape. The Ericksens enjoy succulents, cactii, and roses are very happy to share their garden with us.